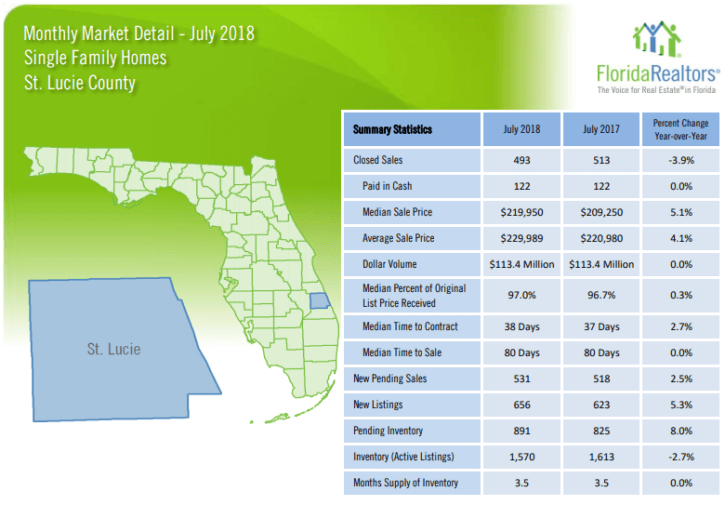 St Lucie County Single Family Homes July 2018 Market Report had mixed sales activity when compared to last year, but remains a very strong real estate market. Closed sales were down by 3.9% (in June they were down by 9.3%) and new sales under contract (new pending sales) increased by 2.5% (they were up by 0.4% last month). Prices, however, continued to rise. The median and average sales prices up by 5.1% and 4.1% respectively from last July (For June these numbers were up 12.4% and 8.7%). These price rises are a bit less severe than we’ve experienced in the past few months. Active listings increased by 64 homes down to 1,570 homes. This inventory is 2.7% lower than last year. The current supply of homes is 3.5 months (was 3.3 months for June) and also 3.5 months for last year. The St Lucie County single family home market remains a strong sellers’ market. A balanced market is one with a 6 to 7 month supply of inventory.